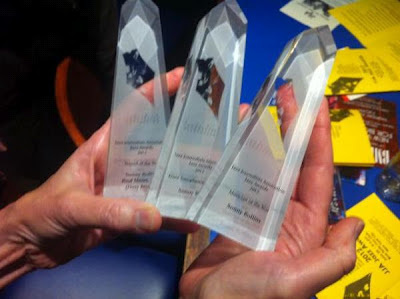 Three 2012 JJA Jazz Awards to Sonny Rollins. Photo by Tom Wetmore. Sonny Rollins, saxophone colossus, was the big winner of the 2012 Jazz Journalists Association Jazz Awards, announced this afternoon at a gala party at the Blue Note Jazz Club in New York City. The tenor saxophonist was named Musician of the Year, his album Road Shows, Vol. 2 chosen as Best Record of the Year and he was judged Best Tenor Saxophonist, too. Horace Silver, who at age 84 is residing in an assisted care facility in upstate New York, was hailed for his Lifetime Achievement in Jazz. Amiri Baraka, author of the books Blues People and Black Music as well as plays, poetry and social criticism, was the recipient of an Award for Lifetime Achievement in Jazz Journalism; author Albert Murray, age 94, was honored with a "Words and Music" Award, co-presented by the JJA and the Jazz Foundation of America. Robin Bell-Stevens, executive director of JazzMobile, and Adrian Ellis, recently resigned executive director of Jazz at Lincoln Center, were celebrated as New York City "Jazz Heroes." Other Awards in the 40 categories of excellence in music and music journalism voted on by professional members of the JJA went to a broad spectrum of jazz stylists; all the winners are listed below.